‘After Twin Towns our vision for our towns and how we shape them in future has changed ….. (both) our priorities and pre-conceived ideas for the future development of our towns’. When the Carnegie UK Trust initiated our Twin Towns UK programme in 2016, we wanted to trial how small towns across the UK might develop, through twinning relationships, rather than in isolation. By pairing towns with similar characteristics and socio-economic challenges, we aimed to find out how these interactions could act as a catalyst for positive change in the participating town communities. Unusually for a towns-based programme, the communities selected to participate were represented by a wide variety of organisations representing their towns’ interests in some capacity, including a community development trust (in Wooler), a membership based community association (in Northern Ireland), a chamber of trade and Commerce (in the north east of England), a business improvement district (in Wales), an arts based social enterprise (in Lancashire) and a community council in Whitburn. Whether business, arts or community-led, all of those participating found re-charged or brand-new collaborations across sectors critical for the delivery of their projects. In North Shields, the business-led Chamber has well-developed cross-sectoral collaboration, realising wellbeing outcomes that go far beyond their primary economic focus; learning from this collaborative approach has been reflected in its twin ‘Big Heart of Merthyr’ BID’s newly developed heritage trails which have brought about new and fruitful collaborations and increased understanding with the Welsh Speaking Centre and local heritage sector. The short videos above provide a snapshot of these two towns’ learning and the positivity created through their collaboration. These inspirational place-based communities have demonstrated the positivity, re-visioning and ‘can do’ energy that is created when towns come together to build honest relationships rooted in trust, exchange ideas and ‘hold a mirror up’ to their own town. Despite the challenges facing our high streets, these community organisations are ‘using the strengths and people of their area to do the work that’s needed’ to sustain their vibrant communities and tell their story. 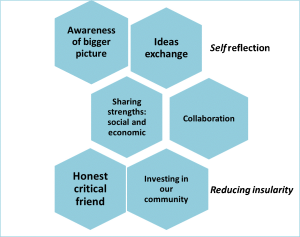 Through learning exchange they have widened their perspectives and capitalised on newly recognised community assets, both economic and social. As we commence Scotland’s Towns Week, what better message to promote than the human flourishing that these town communities demonstrate.